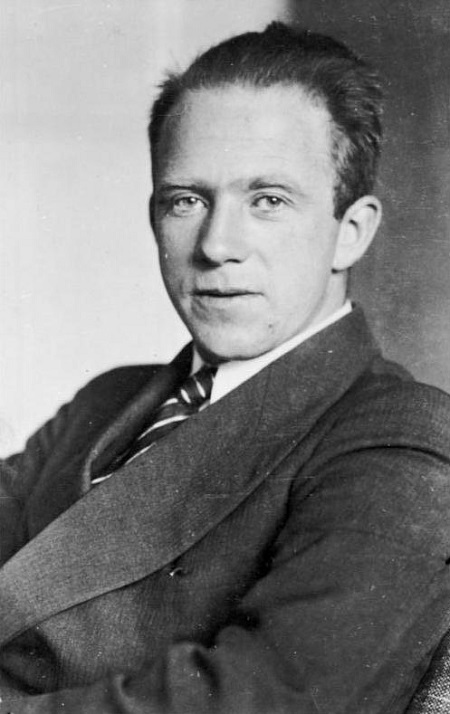 Born on December 5, 1901, near Dusseldorf, Germany, Heisenberg attended school in Munich and studied physics at the university there, receiving his doctorate in 1923. He continued his studies with some of Europe’s greatest physicists, including NIELS BOHR in Denmark. Bohr was already famous for his model of the atom, the miniature solar system that is often taught in middle school science classes. His model explained the properties of hydrogen, the simplest element, but it failed badly when applied to more complex atoms. In the early 1920s other scientists improved the model with versions of quantum theory; including Louis de Broglie, who imagined that waves guided the electrons around the nucleus. In June 1925 Heisenberg took a radically different approach to quantum theory: he abandoned all pictures or models of atoms and considered instead only what could actually be seen or observed. No one can see electrons whiffing around their nuclei, but the patterns of light emitted by hot atoms in a gas, such as in a neon sign, can be seen. He represented the brightness and frequency of the light waves as numbers in a chart and found that the arrays of numbers obeyed the laws of a branch of mathematics called matrix algebra. The new theory became known as matrix mechanics, and it was remarkably successful in predicting the properties of more complex structures. Heisenberg received the 1932 Nobel Prize for Physics for his application of matrix mechanics to molecules made of two hydrogen atoms. Going deeper into the implications of quantum theory, Heisenberg realized in 1927 that the act of observing electrons would disturb them. To get information about the motion of electrons, observers would need to send in some light and record the reflection. But ALBERT EINSTEIN had shown that light, the most delicate probe we can imagine, travels in separate little droplets, called quanta (later known as photons), and even the smallest of them would affect the electrons when they hit. Heisenberg concluded that there is a limit to what can be known about electrons; the more we know of their position the less we know about their motion, and the better we measure their motion the more we cloud their position. He called this the Uncertainty Principle. In 1942-­1945 Heisenberg was in charge of Germany’s project to make nuclear weapons during World War II. The program was poorly funded and many scientists involved were reluctant to make so much progress that Adolf Hitler would have access to nuclear bombs. After the war Heisenberg actively promoted the peaceful use of nuclear power and helped design Germany’s first nuclear plant. He died in Munich of cancer on February 1, 1976. Heisenberg moved our understanding of .the atom into the realm of quantified mathematical measurement, which refined the newly developing field of quantum mechanics. More importantly, his Uncertainty Principle and strict adherence to observation and mathematical measurement in scientific analysis of subatomic phenomena added a cautionary dimension to the field of nuclear physics. Heisenberg’s more lasting contribution was his Uncertainty Principle, setting a limit on what can be known about electrons and their subatomic relatives. Before Heisenberg scientists believed that any quantity could be measured as accurately as the equipment and the human mind would allow. When the objects under investigation are atoms or their parts, though, nature itself seems to prevent a total description. Einstein was never satisfied with the Uncertainty Principle, believing that the limits it recognizes are attributable to the design of the experiment. Repeated challenges by both theory and experiment throughout the twentieth century have always supported Heisenberg’s position. Perhaps Heisenberg’s greatest legacy is his method of starting from what one can actually observe and measure, rather than from a mental picture or a mechanical model. It was a radical change in how scientific problems were addressed, and it was largely responsible for the success of quantum theory. Scientists have yet to develop an accurate picture or model of an atom, the basic unit of everything. Quantum theory transcends the human ability to see and imagine, giving researchers a powerful tool to explore nature while also making it difficult to discuss and understand the results.